If you aren't changing your lesson plans to correspond with the time of year, you are missing out on a golden opportunity to increase student engagement. 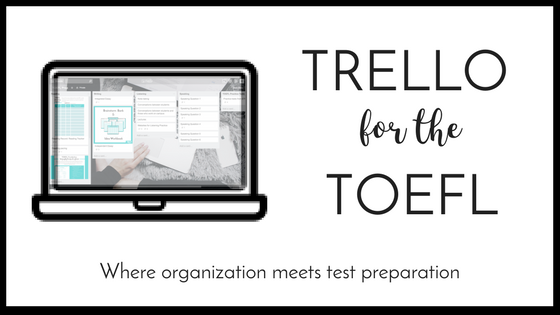 While language teachers frequently utilize seasonal and holiday vocabulary, test prep teachers, too, can take advantage of student interest and capitalize on the calendar to take the relevance of test prep to a new level. Don't limit practice to what is in the test prep book. It is possible to keep the content academic while still harnessing the enthusiasm for the given season. Students of all ages are frequently intrigued by Halloween and who can blame them. Dressing up in costumes and going trick or treating are not celebration staples in many places outside of the United States. For students studying abroad in the United States, Halloween themed lessons provide important cultural context in addition to an opportunity for seeing how academic vocabulary is utilized outside of test prep practice books. While you might want to forgo teaching a straight list of Halloween vocabulary like Jack-o-lantern, werewolf, and vampires, there are many options for drawing upon Halloween as the source of inspiration for practicing skills seen on all 4 sections of the TOEFL. 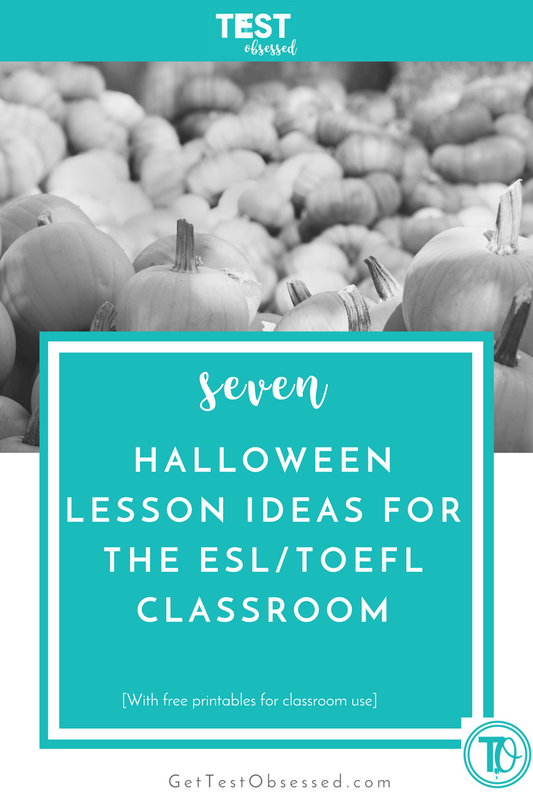 Here are my top 7 ideas for how to bring Halloween into the TOEFL prep classroom. Passages that trace the origins of food and other cultural topics are commonplace on the exam. The History channel offers in-depth examinations into the origins of holidays, and Halloween is no exception. The History channel uses a high level of vocabulary, with their passage on Halloween's origins earning a 10-12th grade bandwith reading difficulty, sure to present a serious challenge for any language learner. Make up questions to go along with the passage yourself or make the students take on the role of test-maker and create their own questions and answers to correspond with the passage. Do you know how much money the average American consumer spends on Halloween? While many associated spending money with Christmas, consumer trends surrounding Halloween make for a great way to incorporate another discipline in the mix with a reading passage like this one from The Atlantic. Want to get students to practice taking notes on stats they hear instead of those they read? Consider reading the passage aloud. Give students an economics-focused passage to create the variety they need to be prepared for any subject come exam day. Have a little bit of leftover time towards the end of class after having gone over a tough academic topic or dissecting a long practice test with the class? Let students casually get to know one another and practice speaking/listening skills with a short game. Have all students in the class write down their answer to what costume they would most like to wear and why. Each response should be very short. Mix them up and have students try to match the answer to their classmates. For another take using the same skills, play 20 questions. Show students a picture of a Halloween costume (like Spider-Man, for example) and have the remaining students ask yes/no questions until they figure out what the costume is! Do you agree or disagree with the following statement? Holidays, like Halloween, are only important for children. Do you agree or disagree with the following statement? People spend too much money on holidays. Do you agree or disagree with the following statement? American Halloween traditions should be adopted by more countries across the globe. Does your school let students and staff dress up for Halloween? If not, have students write a persuasive piece reflecting their position on this question. Download the set of questions in a convenient printable perfect for classroom use. When students hand them in, consider hanging them up around the room to decorate and capture the Halloween spirit. Thank you! Click here for your printable. Be sure to grab more TOEFL tips right in your inbox. Take a totally untraditional route in order to stave off burnout before it sets in. While endless worksheets and reading passages might get monotonous, most students have a nearly endless patience for watching TV shows or movies. Get students to locate new vocabulary from a scary movie of their choosing. Take the opportunity to teach students some vocabulary that might appear in film classes that find their way into the exam and use scary movies as examples. Have students put together their own reading passage on elements of horror movies to familiarize themselves with common reading passage structures. Note: You may want to give students a heads up regarding how scary (or not) any of the given Halloween movies might be. Many of these talks are inspired by the creatures most closely associated with Halloween. Halloween is more than just witches and mummies. Have students practice biology terms with lectures on bats and spiders. Put psychology in center stage with lectures about fear and serial killers. Ted Talks are great practice for students as they combine intriguing topics with academic vocabulary and organization. With 10 spooky lectures lined up, students will be able to get quality note-taking practice on a bunch of hair-raising topics. What can make memorizing vocabulary or practicing grammar more palatable? Candy corn, Reese's Pieces, and Hershey's candy bars! Use candy as an incentive for correct answers on a grammar worksheet or take any reading passage (extra points if it focuses on candy) and ask students to locate antecedents placed throughout. Just because standardized tests don't always reward creativity doesn't mean you shouldn't incorporate some. Don't be scared to use Halloween to allow students to practice the skills needed for all 4 sections of the exam.